The Tandy 1000 TX was similar to the Tandy 1000 in that it had an external keyboard and casing. 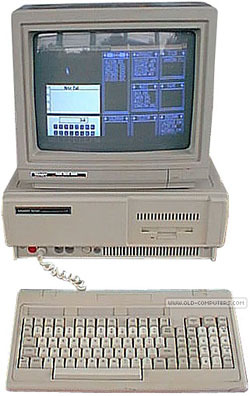 The difference, however, was the addition of an 80286 CPU on the TX model; otherwise, it was nearly identical to the Tandy 1000, including the odd parallel port edge connector. The TX had a 3.5" drive, with an optional 5.25" drive. It contained hookups for two joysticks in the front along with the keyboard, and included a volume control with a phono input on the front. The back had all of the same ports as the Tandy 1000. The memory size was 640k (upgradable to 768k, which was devoted to video) and the computer came bundled with Deskmate II. The TX had a special function to the F4 key that would reduce the speed of the processor to half the normal rate for programs(mainly games) that 8-10 mhz was simply too fast for. To activate this function, you held down the F4 key during boot-up. see more Tandy Radio Shack 1000 TX Ebay auctions !